There is a reason that the Austin area is considered “one of the most flash-flood prone regions in North America”. According to the Lower Colorado River Authority, Austin has received between 8 and nearly 16 inches of rain in the last two weeks and the ground was saturated before that. 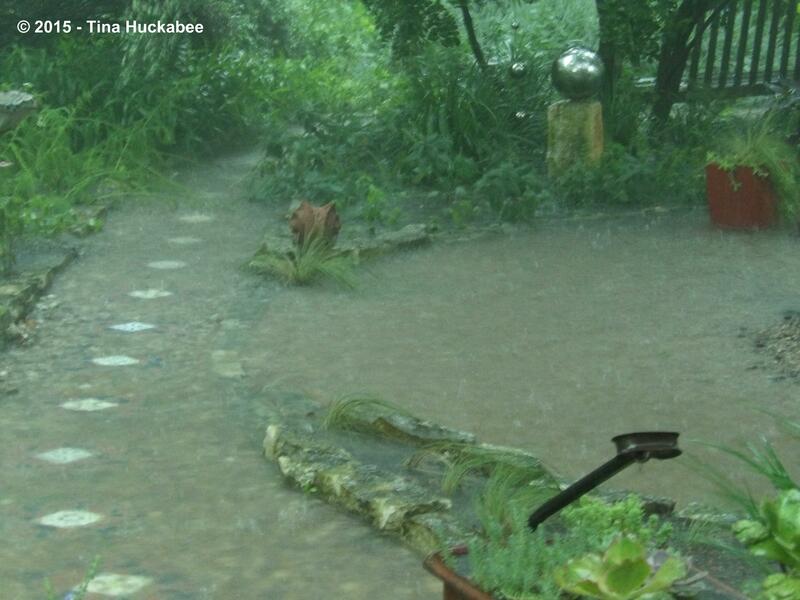 Today, 3-4 more inches dumped on Austin and its surrounding area from a round of severe thunderstorms. 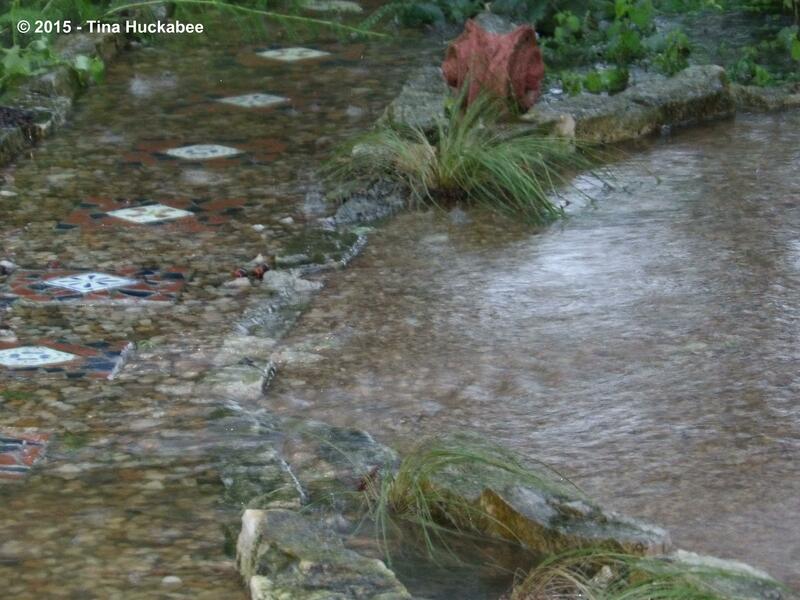 Rivers and streams throughout Central Texas are spilling over, flooding, causing damage, and endangering lives. Additionally there have been tornado warnings throughout the day and continue for some. Once again, Central Texas has proved that it’s subject to flooding and with disastrous results. On Saturday, the beautiful little Blanco River overflowed its banks, inundating the nearby towns of San Marcos and Wimberley, as well as other smaller communities. As of now, there is at least one dead and a number, not yet determined, missing. Homes washed away, businesses flooded, stately Bald Cypress Trees, alive when Texas was part of Mexico, were uprooted and tossed aside like skinny twigs; the damage is hard to look at and comprehend. Throughout Texas and Oklahoma, severe storms and heavy rain has been the norm over the past few weeks. Late spring weather patterns can produce severe weather events in Central Texas. 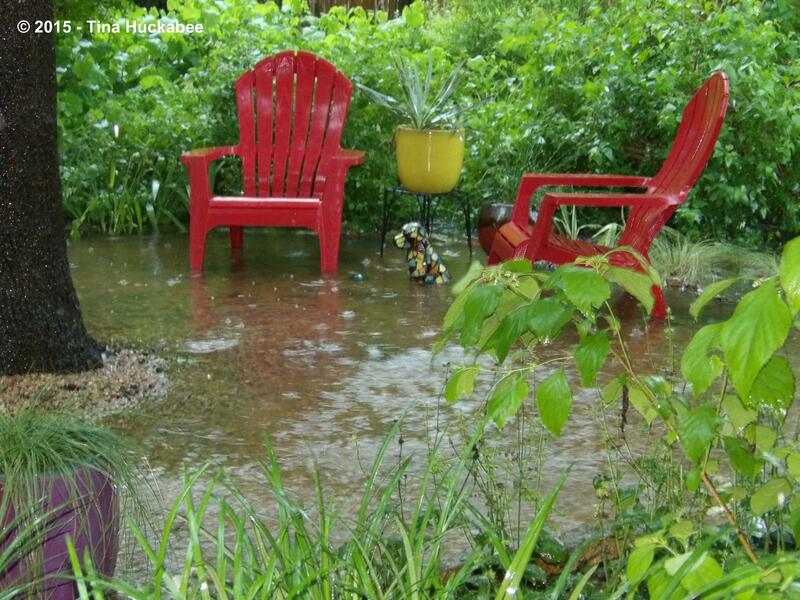 Having suffered an 8 year drought and with the unfamiliarity of Central Texas’ mercurial weather patterns, many who’ve moved here in the last couple of decades don’t realize how catastrophic heavy rainfall is. I’ve lived in Austin since moving here in 1978 to attend The University of Texas. I was a student during the historic 1981 Memorial Day flood; thirteen people died that day. You can read about that devastating event here and here and here. The flooding of these past few days will probably not be the history maker that the 1981 flood was, but it’s bad enough. This rain “bomb” may be what breaks our 8 year drought–time will tell. The local lakes, which supply water to this increasingly populated region of the U.S. are rising and quickly, though none are at full capacity yet. The higher levels of Lake Travis and the other dammed reservoirs in Central Texas is the positive result of the heavy rainfall and resulting flooding. In Texas, it is often a spring flooding event or a late summer/fall tropical storm or hurricane that breaks the hold of a drought. 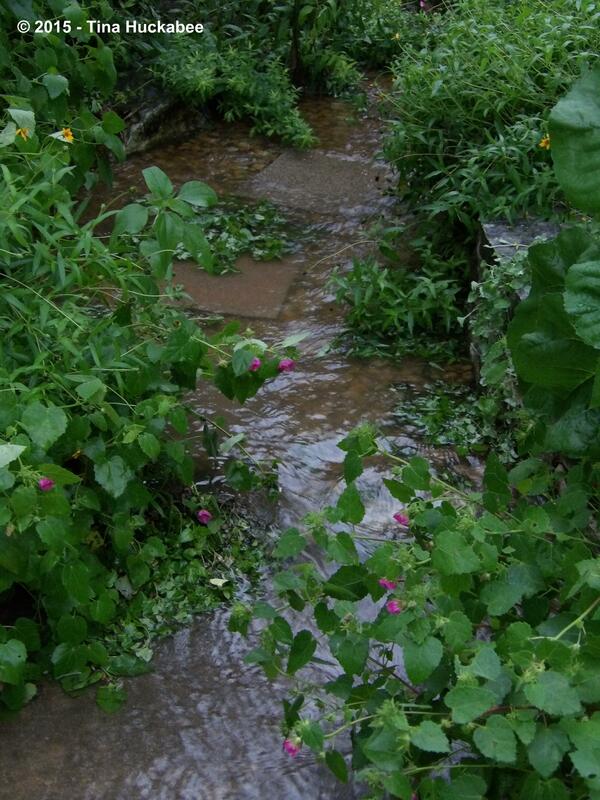 The water flows away from my house because I built rock walkways to divert heavy rainfall. 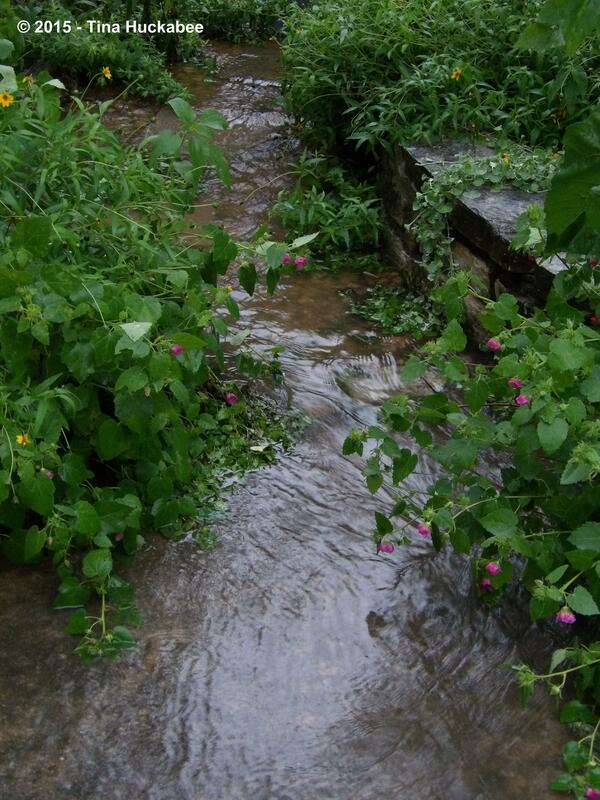 This afternoon, the walkways looked and acted like flowing rivers. Here in Texas, you learn to take the good with the bad. My own home is fine. My family and neighbors are all safe. 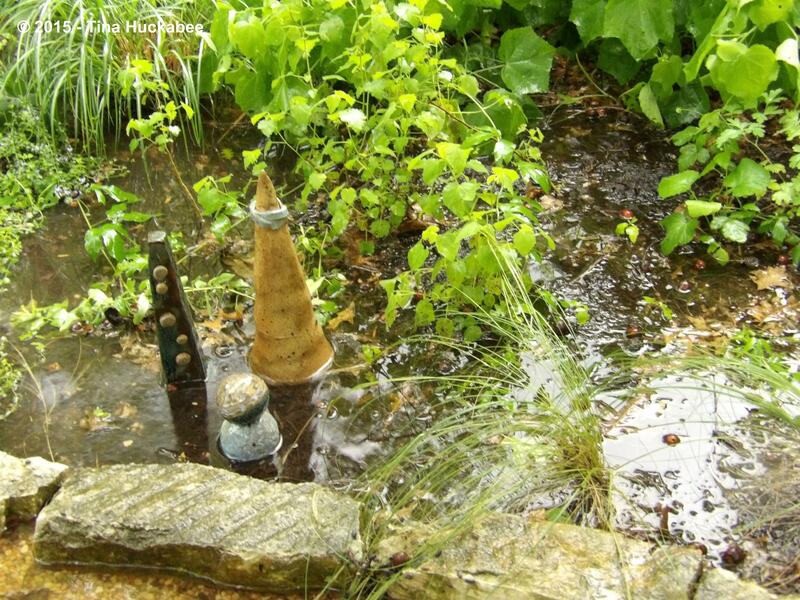 Water-logged soil with droopy plants, my gardens will recover. 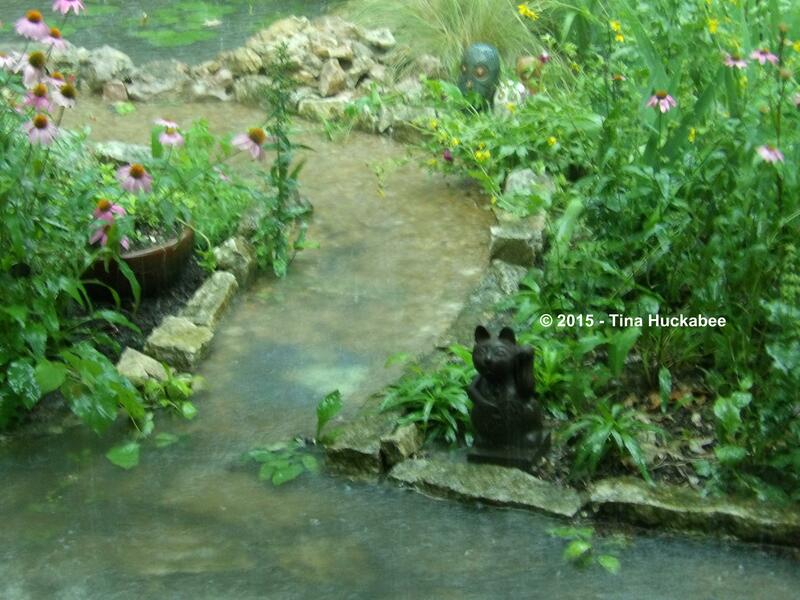 As I write this, the rain has stopped and almost all of the water has drained from my gardens and pathways. I am very grateful. We are appreciative and full of admiration for the first responders–police, firefighters, EMS workers who risk their lives to rescue citizens from floating cars and flooded homes. The world is full of tragic stories. It requires only few minutes of listening to or watching news to feel despondent and helpless about disasters, prevalent and ongoing, made by humans or gifted by nature. If you feel compelled to help flood victims who have lost their homes in Central Texas, see the American Red Cross website. Please remember and give what you can to others who are in need–wherever they may be. 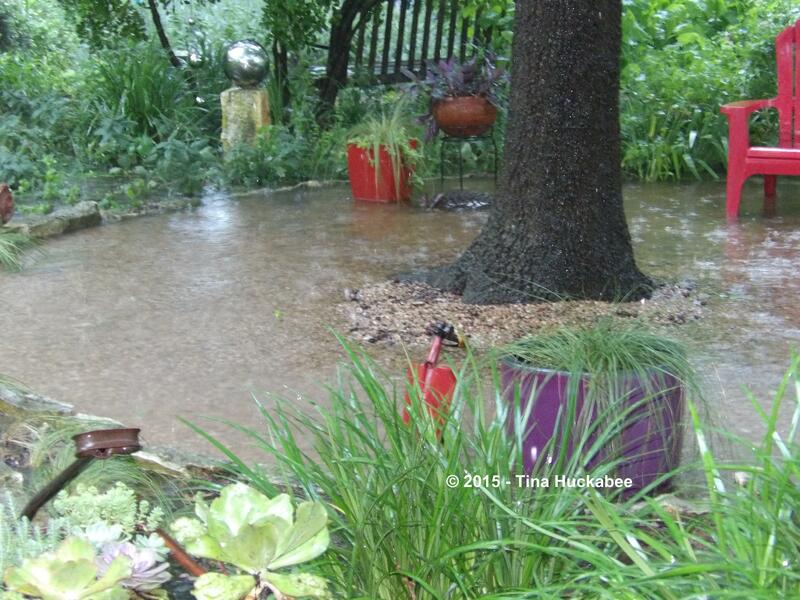 This entry was posted in Uncategorized and tagged Central Texas Flooding by Tina. Bookmark the permalink. Tina, sorry to read your post this morning, flooding is miserable, glad to hear your own family are fine, I hope your wider community fares well too. Thank you, Julie. Flooding is miserable and so much more for those who already live in marginal situations or who get caught in a dangerous or tragic place–it can certainly be horrific. I always keep perspective: this terrible event happened in a place that enjoys good infrastructure and reasonable wealth. Except for those who died or whose family members died, all is fixable–in time. As for those whose lives were lost, there are no words. I just spent several minutes this AM reaching out to friends living in the storm affected areas, trying to determine that everybody is safe, all their homes, secure. We are soggy but fine, and I’m relieved to read you and yours are as well, something I know not to take for granted when Texas weather turns destructive. I appreciate the links to the organizations that are and will continue to provide assistance to the many families disastrously affected by recent events. This is not a quick fix situation, and things are not “over”…folks in East Texas are still experiencing severe weather with additional flooding developing. “Hot and dry” in a forecast will look good when we get there this year…at least for a while! Yup, I did the same late yesterday–checking on folks I know in the Wimberley area. You are correct though: those living east of Central Texas are still in harm’s way and we will all need to remain vigilant as the forecast predicts more rain. Austin wasn’t quite as badly hit as is was in ’81, but that’s certainly not true for the outlying areas. I heard this morning an update on the rainfall totals of yesterday afternoon, not the 3-4 inches that I’d heard, but 5.5 inches. Lots of wet. It’s been a long time since I felt the need to place pillows, blankets, flashlights and other supplies in the interior room of our house (which is a bathroom), but did do that this past weekend because of the tornado warnings. Hot and dry–sounds pretty good right about now. 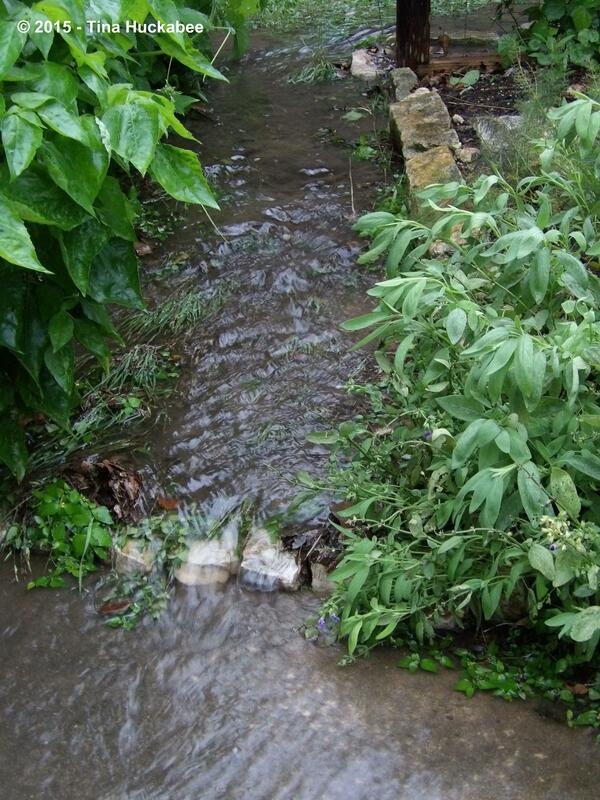 Good information and pictures of how you divert water in your garden. We left Austin yesterday and the storm was on our heals. We got home to a few hours of quiet and then the water just drenched us for hours and hours. 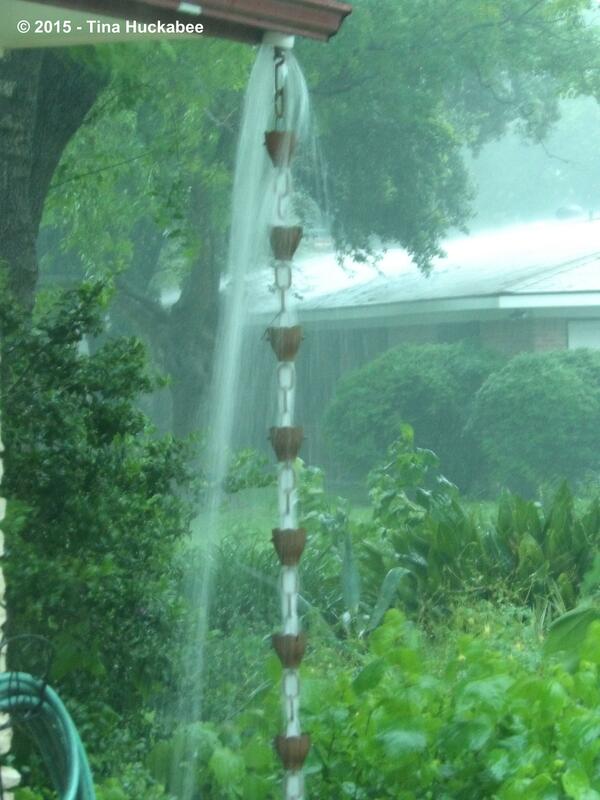 I have only seen it higher here in my home in the Heights (highest place in Houston) during Allison. We got 8+ inches and the city is shutdown today. I have not heard of any deaths like they had up in Wimberley. I am praying for all the stranded travelers and people whose houses flooded. Water is such a powerful force and one that I have the deepest respect for it! And thank you for reminding us how to reach out to help others. Wishing you a sunny week! Glad you beat the storm. 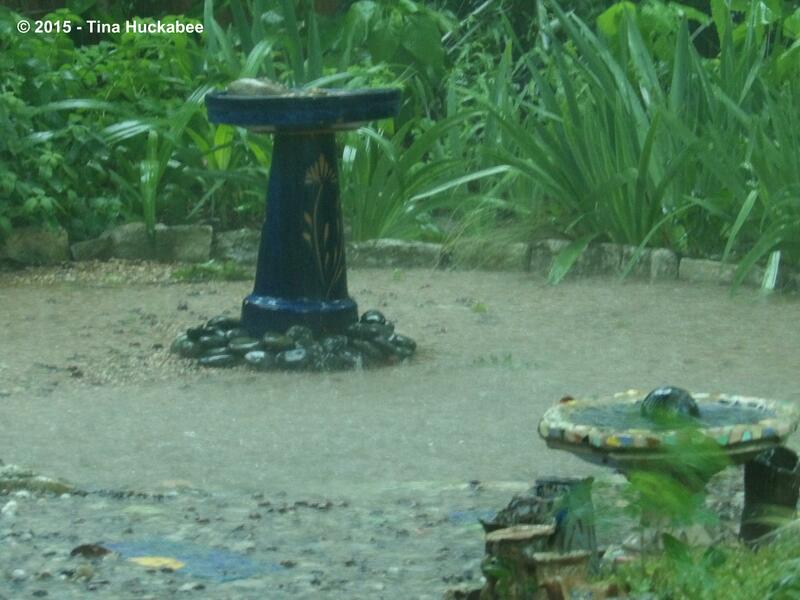 I’m not surprised that you got lots of rain–there’s lots to be had lately. I was supposed to go to Corpus Christi and decided not to because of the forecast. Be safe, dodge the hordes of mosquitoes and a sunny week to you too! You’re welcome–thank you for your volunteerism and assistance to the community during this difficult time. I’ve been following the flooding in Austin as well as in the San Marcos area, as we lived in San Antonio on several occasions. My husband and I both also have relatives north of Houston, so we’re keeping an eye on that area and keeping in touch with those folks. 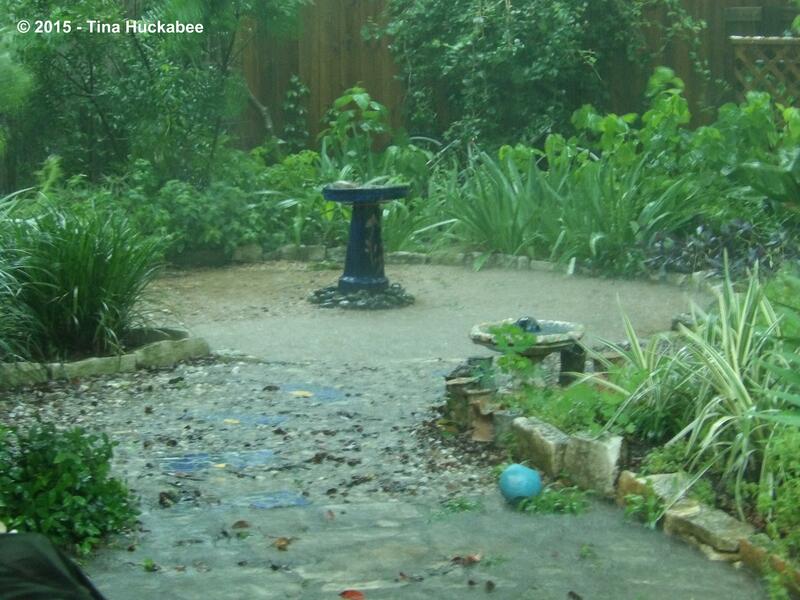 It’s just been one of those years…as you said, Texas weather is so unpredictable, especially at this time of year. I’ll be thinking of you and wishing you well, praying that things settle down a bit. The sun is actually shining today — at least here! — so I hope you’re getting some sunshine, too. Be careful! Back atcha. I watched with horror at Wichita’s flooding last week, knowing what can happen here–and it did. While the Austin area was badly hit, it’s not as bad in town as the other places such as Wimberley, San Marcos and now, Houston. Tragically, the death toll is rising. Unfortunately, not a surprise, but I’m very sorry for the loss of life. We’re seeing the sun today, peeking in and out of clouds, but like you, still have rain in our forecast. I do hope we can dry up a bit before another round hits, but the regions east and south will have to deal with the flooding in the next few days. You and yours stay safe too!! Wishing good things for Texans. And everyone else. Wow, that is frightening to see. 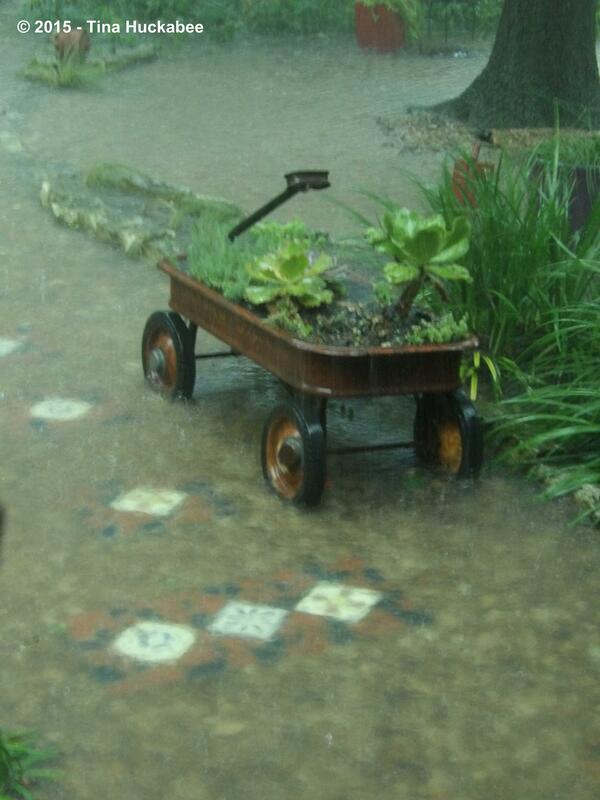 I hope that the weather calms but also that all this rain does mean an end to your drought. And thanks for recognizing all the public service workers who help their communities overcome these emergencies. Yes, it is frightening. The power of water and the fierceness of thunderstorms are not to be trifled with. Our forecast does seem to be mellowing a bit, but there’s still some rain in the forecast, though not the torrential downpours of this past weekend. The end of the drought–hmm, there are two ways to look at that. There is the meteorological drought, the end of that which is unclear at this point. But definitely the reservoir drought is lessened. Lake Travis is up from 33% full to about 65% full. Good progress, but at a great cost. I so admire first responders–their courage and commitment to their communities–it’s quite something, I think. They are amazing and lucky you to be married to such a good guy. It’s is awful, but these hard-hit communities will recover in time. On Morning Edition (NPR) this morning, John Burnet, who is a reporter from Texas, quoted someone from the 1920’s or ’30’s (it was really early when I heard this)–something to the effect of “Texas weather is severe drought, broken by devastating floods.” Yeah, that’s about right. That is a lot of water in your yard. I’m glad it flowed away quickly. I’ve seen pictures of the impacts of the flood over the last week, but nothing could prepare me for the devastation I witnessed yesterday when my husband and I dropped off clean-up supplies to the volunteers in Wimberley that are helping the families impacted and the community recover after the tragic event. Seeing the ancient knocked-down cypress trees and buildings that were dislodged from their foundations and transported blocks or even miles down the river was an unbelievable site. I continue to think of those impacted by the floodings, and I’m grateful to those who are helping the communities clean-up and recover. 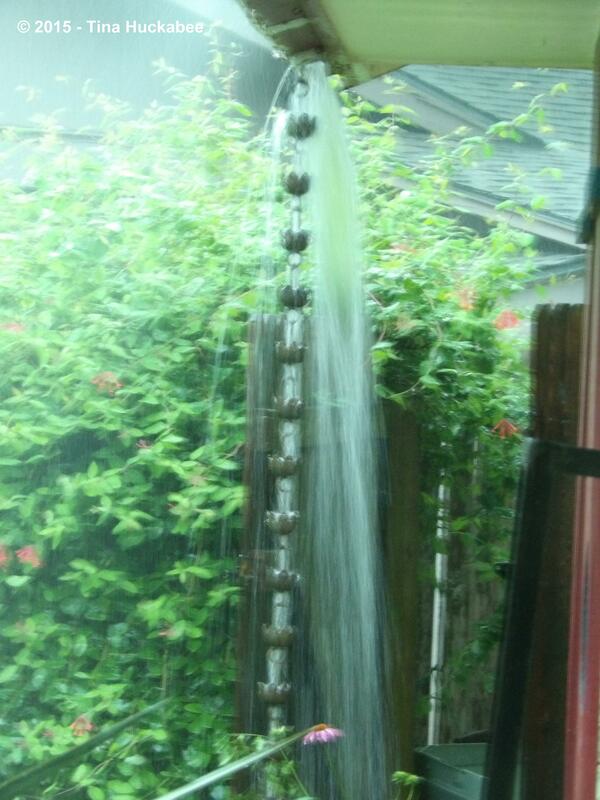 I’m fortunate that the water drains quickly from my property. I can’t imagine what those poor unfortunate folks in Wimberley (and Houston and Dallas, for that matter)are going through–but it’s heartening to see the community outpouring of assistance. I was in Corpus Christi (where I’m from originally) and 8 of the victims of the flooding were from there. The good folks of CC are fundraising and sending teams to assist in the search for the rest of the missing. Like you–so grateful, appreciated and full of admiration for the first responders and all the community help. Great photos. Water is a tough thing to capture on film. I am grateful for the rain but yeah … it has been tough for some.